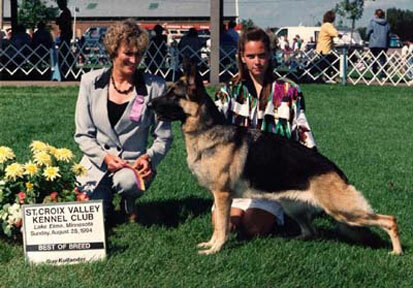 "Ch Rosewood's Sabrina Linden Hill (Ch Hoheneichen's Magnum x Linden Hill's World Series v Cinnbar) this lighter black and tan, medium-sized, feminine lady was an excellent mover with a good back. She exhibited great attitude and showmanship. She had everything together on this day."